Talk about project management is quite simple. Basically they talk about how to deliver project on schedule, on time and on budget. But how to achieve that is not simple. I have experienced manage a project team of IT Application. I have team members, budget for overhead (money for overtime, dinner, transport, etc...), and the most important things are schedule and target. I think that it was quite easy because all of these things have created for me by the pre-sales team before the project it self. All I have to do is create project planning, execute and monitor what I have planned before. Today I work in business development team. One of the job description require me to do pre-sales activity. In this case, I have to prepare the project management at different point of view : definition & initiation. I have to conduct series of activities, start from analyze the requirement, how to translate the requirement to solution, create the project plan and proposal, negotiate the budget and time frame for the project. Basically, I have to prepare the TIME, COST and SCOPE in a document for my team and for customer. In this article I gather and summarize several articles that related with project management. It talks about the constraints, stages, skills and some tips about it. It is very useful for basic and middle level knowledge about project management. This article affects 2 point of views: project management from coordinator's view, and project management from pre-sales's view. The project management triangle is used by managers to analyze or understand the difficulties that may arise due to implementing and executing a project. All projects irrespective of their size will have many constraints. Although there are many such project constraints, these should not be barriers for successful project execution and for the effective decision making. There are three main interdependent constraints for every project; time, cost and scope. This is also known as Project Management Triangle. The three constraints in a project management triangle are time, cost and scope. A project's activities can either take shorter or longer amount of time to complete. Completion of tasks depends on a number of factors such as the number of people working on the project, experience, skills, etc. Time is a crucial factor which is uncontrollable. On the other hand, failure to meet the deadlines in a project can create adverse effects. Most often, the main reason for organizations to fail in terms of time is due to lack of resources. It's imperative for both the project manager and the organization to have an estimated cost when undertaking a project. Budgets will ensure that project is developed or implemented below a certain cost. Sometimes, project managers have to allocate additional resources in order to meet the deadlines with a penalty of additional project costs. Scope looks at the outcome of the project undertaken. This consists of a list of deliverables, which need to be addressed by the project team. A successful project manager will know to manage both the scope of the project and any change in scope which impacts time and cost. Quality is not a part of the project management triangle, but it is the ultimate objective of every delivery. 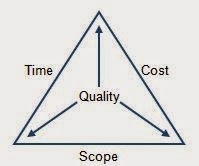 Hence, the project management triangle represents implies quality. Many project managers are under the notion that 'high quality comes with high cost', which to some extent is true. By using low quality resources to accomplish project deadlines does not ensure success of the overall project. Like with the scope, quality will also be an important deliverable for the project. Project Definition: This refers to defining the objectives and the factors to be considered to make the project successful. Project Initiation: This refers to the resources as well as the planning before the project starts. Project Planning: Outlines the plan as to how the project should be executed. This is where project management triangle is essential. It looks at the time, cost and scope of the project. Project Execution: Undertaking work to deliver the outcome of the project. Project Monitoring & Control: Taking necessary measures, so that the operation of the project runs smoothly. Project Closure: Acceptance of the deliverables and discontinuing resources that were required to run the project. It is always a requirement to overcome the challenges related to the project triangle during the project execution period. Project managers need to understand that the three constraints outlined in the project management triangle can be adjusted. The important aspect is to deal with it. The project manager needs to strike a balance between the three constraints so that quality of the project will not be compromised. To overcome the constraints, the project managers have several methods to keep the project going. Some of these will be based on preventing stakeholders from changing the scope and maintaining limits on both financial and human resources. A project manager's role is evolved around responsibility. A project manager needs to supervise and control the project from the beginning to the closure. The project manager needs to define the project and split the tasks amongst team members. The project manager also needs to obtain key resources and build teamwork. The project manager needs to set the objectives required for the project and work towards meeting these objectives. The most important activity of a project manager is to keep stakeholders informed on the progress of the project. The project manager needs to asses and carefully monitor risks of the project. Project management is very often represented on a triangle. A successful project manager needs to keep a balance between the triple constraints so that the quality of the project or outcome is not compromised. There are many tools and techniques that are available in order to face the challenges related to the three constraints. A good project manager will use appropriate tools in order to execute the project successfully. The Project Management Triangle (called also Triple Constraint or the Iron Triangle) is a model of the constraints of project management. It is a graphic aid where the three attributes show on the corners of the triangle to show opposition. It is useful to help with intentionally choosing project biases, or analyzing the goals of a project. It is used to illustrate that project management success is measured by the project team's ability to manage the project, so that the expected results are produced while managing time and cost. If time, money, or what your project accomplished were unlimited, you wouldn't need to do project management. 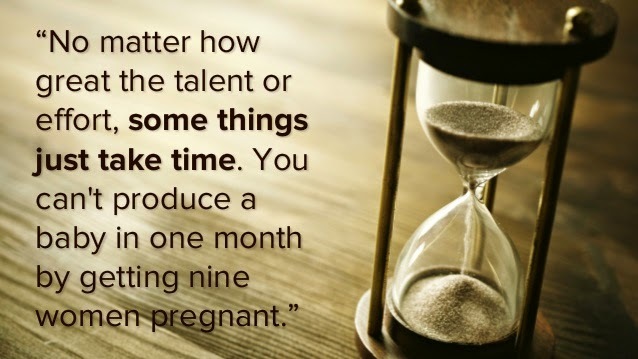 Unfortunately, most projects have a specific time limit, budget, and scope. It is this combination of elements (time, money, and scope) that we refer to as the project triangle. (These competing elements are sometimes referred to as the triple constraints of a project.) Understanding the project triangle will allow you to make better choices when you need to make tradeoffs. How do I optimize to meet my schedule? After analyzing your schedule, you might find it does not meet the project deadline. There are several ways you can adjust the length of your schedule. The methods you choose depend on the limitations imposed on the project as a whole, such as budget, resource availability, scope, and the flexibility of the tasks. Shorten the durations of tasks (usually a reflection of reduced scope or increased/more efficient resources). As you adjust the schedule, your costs might increase, resources might become overallocated, and your scope might change. For example, if you shorten durations of tasks on the critical path, the project will probably finish sooner, but the scope of those tasks and possibly the entire project might be reduced. Or if you assign additional resources to critical path tasks so that they can be finished more quickly, you might find that these resources are now overallocated, and you need to pay overtime, increasing your costs. How do I optimize to meet my budget? You might find that the Project plan you have built exceeds your budget. Project costs are affected primarily by resources assigned to the tasks in the project: the rate-based cost and the fixed costs of people, equipment, and materials. Therefore, to reduce costs, you can cut project scope so that there are fewer tasks or shorter durations for tasks that need resources. If you don't want to cut scope, you can adjust resources and make sure that your settings for rates, fees, and overtime are correct. You can verify that the resources assigned are the best for the job. You might be able to replace a more expensive resource with a less expensive one, and use the more expensive resource where it is most cost-effective. As you adjust the plan to meet your budget, your finish date might be extended, or the scope might decrease. For example, if you remove overtime from tasks that had overallocated resources assigned, you might find the schedule lengthened to the point where the finish date is a month later. Or if you've cut scope to meet the budget, you might find that the finish date is actually scheduled to occur sooner. How do I optimize to meet my scope requirements? Product scope describes the final deliverables of the project, usually in great detail. Examples of product scope include product specifications or blueprints. As a project manager, you may not have much control over product scope. Project scope includes all of the project work done to produce the deliverables described by the product scope. As a project manager, you normally have at least some control over project scope. For example, you may be able to skip code reviews for some deliverables. Typically, you adjust scope when you find a problem with meeting the finish date or the budget. You can cut scope to bring in the finish date or cut costs. You can also increase scope if you find you have additional time or an increased budget available. Changing scope usually involves changing the number or the duration of tasks. Scope is closely related to quality. When you increase scope, you have the opportunity to build in higher quality. When you decrease scope, you might need to lower standards of acceptable quality. If you reduce scope, your costs might decrease and your finish date might occur sooner. If you add scope, your costs might increase and your finish date might be later. For example, if you cut a series of tasks that were considered optional, you may not need as many resources, resulting in cost savings. Or if you're increasing scope by adding more time to a series of tasks, you might find that changing scope affects the scheduling of critical path tasks, and the finish date is now two weeks later.